Chloride levels in Lake Colby have more than doubled in the last 20 years. After the Village of Saranac Lake built a shed to house its salt in 2010 the influence of that source subsided. The current high levels are due almost completely to salt runoff from Route 86. Recent studies show that road salt damages native plants but ironically Eurasian Watermilfoil thrives in high-chloride solutions, including the brackish waters of the Chesapeake area and in Florida. The current levels of sodium and chloride in the lake violate federal standards and Lake Colby has the highest levels of these ions of any inhabited Adirondack lake. Solution of these problems requires rapid action by the Town, Village, and Department of Transportation. We are engaged with all three. There are five culverts under Route 86 feeding runoff into the Lake from the east. Three of these are State culverts built when the road was constructed in the 60's. They have no buffers, silt filters, etc. and they dump runoff directly into the Lake. 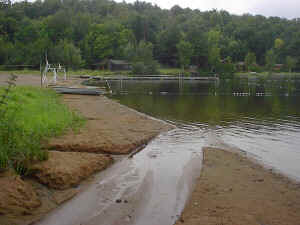 The southern-most culvert can actually create a stream across the Village of Saranac Lake's public beach (click to see photo). We have presented this and other evidence to the State, Town, and Village and are lobbying them to re-work these culverts to provide up-stream silt filters and sedimantation basins and natural foliage buffers of phosphorus-absorbing plants (like cattails). Adirondack Medical Center has a sedimentation basin for accumulated rainwater that captures water before it flows into the Lake. We have asked, and they have agreed, to plant natural foliage buffers like cattails in this basin.